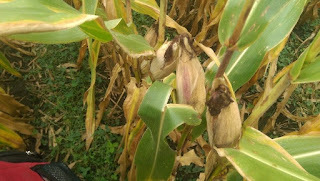 Corn growing in kura clover living mulch. A living mulch is a cover crop under-seeded into annual crop production. Kura clover is a vegetatively-spreading, nitrogen (N)-fixing, winter-hardy perennial legume native to eastern Europe. Kura clover’s spreading habit gives it the ability to survive harsh agronomic management, which makes it a prime candidate for use as a perennial living mulch. Kura clover’s N-fixing ability and dense mat of roots benefit the producer and the environment by reducing N application requirements, protecting against soil erosion, and capturing excess N in the soil. Although kura clover living mulch has many potential benefits, this system may not be a perfect fit for all producers. 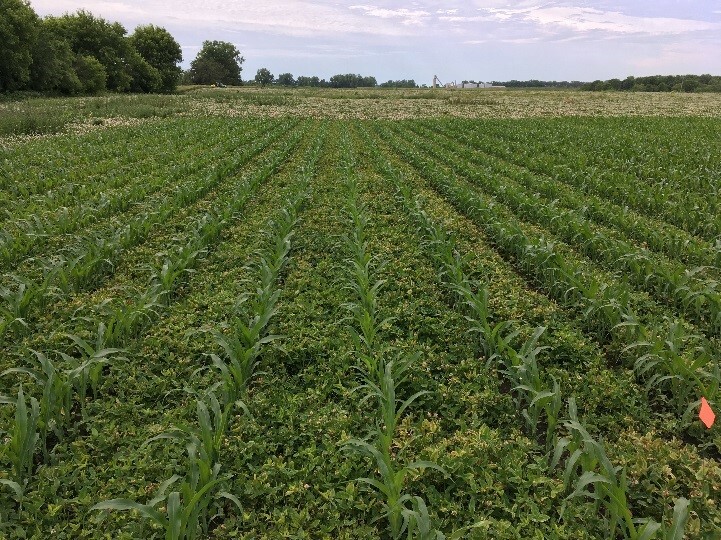 Maintaining kura clover after corn production requires stover removal, which would benefit producers harvesting silage or corn stover, but makes it less useful for those with no use or market for these products. Additionally, kura clover is slow to establish from seed, difficult to manage in the spring, and may compete for soil moisture during dry years. Research on corn and soybean production in kura clover living mulch by the USDA-Agricultural Research Service and University of Minnesota began in 2006. In 2017, with funding from the Minnesota Corn Research and Promotion Council, N management was studied in first- and second-year corn grown in kura clover living mulch. This was done through field experiments on silt loam soil in east-central Minnesota in kura clover established in 2006. Intensive spring management is needed to successfully establish corn while maintaining kura clover living mulch. In this study, kura clover was mowed in the spring before a rotary strip-tillage machine created 12-inch-wide strips where the corn was then planted. A second mowing occurred at corn emergence, followed by an application of glyphosate to suppress clover and manage weeds. In this study, a non-N-fertilized control treatment was compared with five N fertilizer rates ranging from 45 to 280 lb N/acre where N was split-applied at planting and the four-leaf corn stage. End of season corn and clover. First-year-corn grain yield with no N fertilizer was 193 bushels/acre and was not increased when N was applied. In second-year-corn, at least 107 lb N/acre was needed to maximize grain yield at 197 bushels/acre. In comparison, University Extension guidelines suggest 145 to 200 lb N/acre for continuous corn on similar soils in this region. 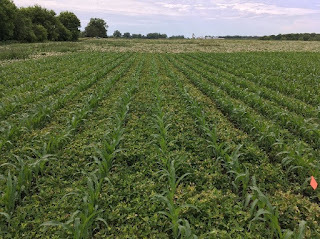 These results demonstrate that a kura clover-corn living mulch system can produce high corn grain yield with substantial reductions in N fertilizer while protecting soil health and water quality. Research on N management for corn grown in kura clover living mulch is ongoing.